A PBi Exclusive Design from Lollipop Lane Jewelry! Handcrafted essential oil diffuser jewelry - keep your favorite scent close all day long. Diffuser lockets offer a unique way to wear your essential oils. Simply add 1-2 drops of your desired oil onto the felt pad inside the locket and it will retain the scent all day long. 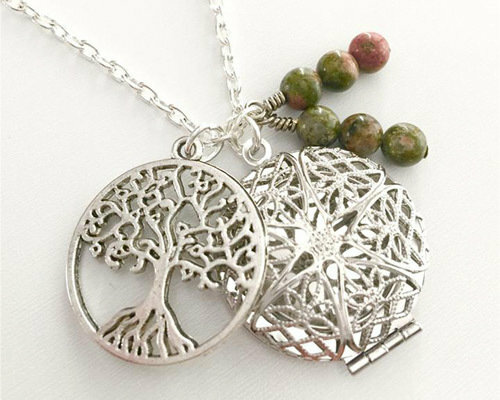 Birth-centered essential oil locket necklace, accented with a Tree of Life charm and multicolored green beads. Necklace length is standard 18" (not including pendant length). Chain and locket is silver-plated and hypoallergenic. RTS (Ready-To-Ship). All of our pieces are individually handcrafted and made to order items may vary slightly from the photo. Gemstones may vary slightly, in shape and color and contain slight natural inclusions. Colors on computer monitors may look slightly different than in person. We do our best to present all our items as accurately as possible. If you have additional questions regarding sizing, etc, please do not hesitate to ask before placing an order.